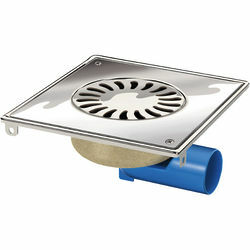 VDB Shower Drains > Steel Shower Drain 200x200mm (Screw Down Grate). Van Den Berg shower drain in stainless steel with screw down grating. Polished stainless steel grating and frame. Stainless steel has the unique ability to resist corrosion, heat damage and chemical damage. Grating and frame in height adjustable and 360º rotatable. 1 Model for horizontal or vertical outlet. Suitable for shower rooms, swimming pools, schools, hospitals, renovations and public toilets.